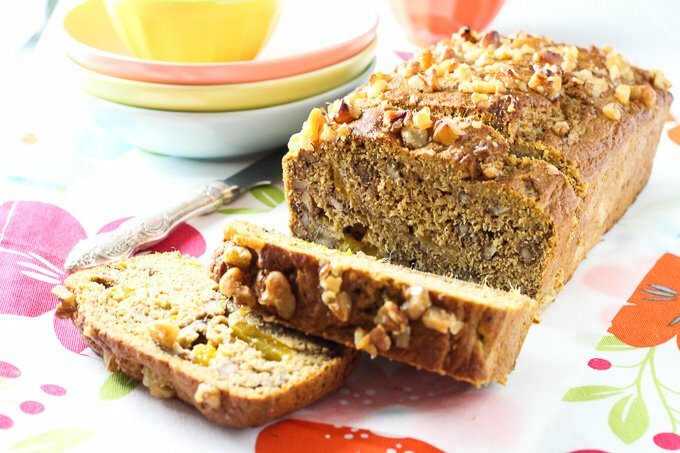 This mango bread is super moist, very dense, and full of crunchy walnut pieces. 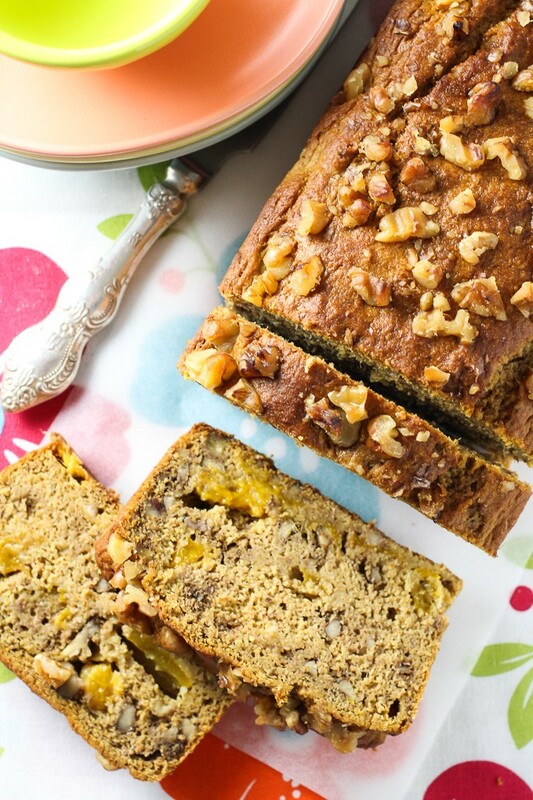 It’s like a banana bread but instead of bananas, it’s made with mangos. It’s great to make during mango season or you can also make it using frozen mango. You know when you check your freezer and realize there is stuff in there you totally forgot about? This happened to me last week when I discovered that I still had my freezer full with mango that I had leftover from making my No Churn Vegan Mango Ice Cream. 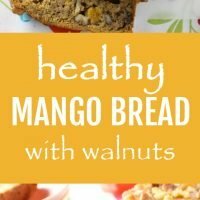 So, I decided to make this Clean Eating Mango Bread. 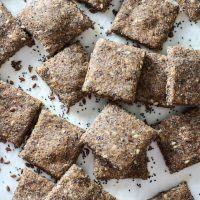 If you haven’t tried cardamom before, don’t skip it! Buy a little bit of ground cardamom at your grocery store (it’s not super expensive) and try it this one time to see if you like it. Cardamom is a wonderful mild spice and works well in baked goods. 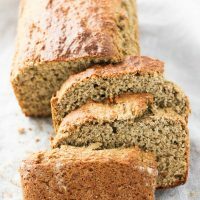 Just a little bit of it adds a wonderful hint of flavor that completely covers the taste of spelt flour present in almost all baked goods that are baked with it. 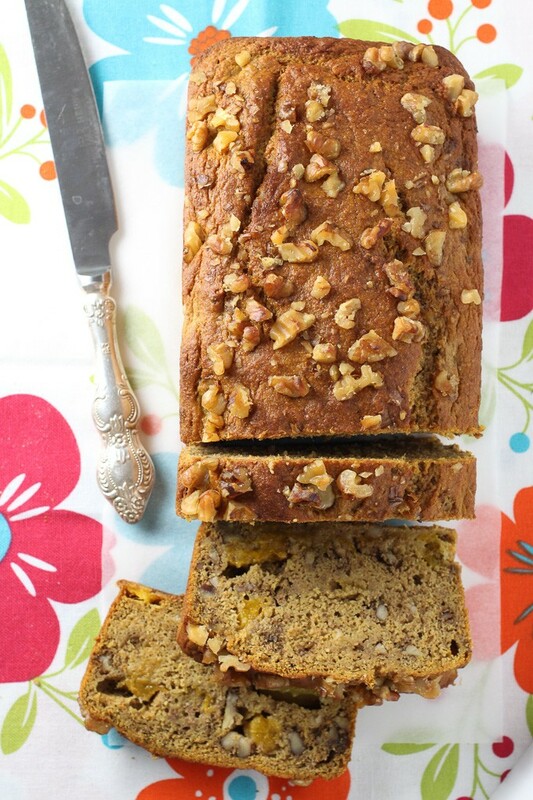 Because this mango bread is so dense, it takes a while to bake it. But over-baking it is also not a good idea. So start checking it after about 45 to 50 minutes. It took 1 hour to bake in my oven, but baking times might vary so be careful. 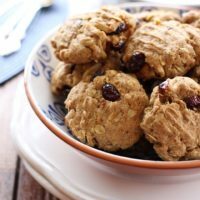 If you like baking with spelt flour, check out these Spelt Raspberry Muffins, these Buttermilk Pancakes Made with Spelt Flour, or these Oatmeal Cookies Made with Spelt Flour. 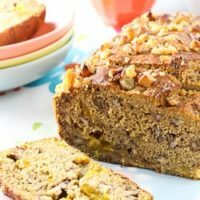 This Clean Eating Mango Bread is super moist, very dense, and full of crunchy walnut pieces. 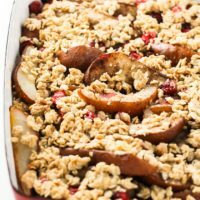 It’s healthy and very easy to make. Perfect as a snack. Place the spelt flour, coconut sugar, baking powder, salt and ground cardamom into a mixing bowl and stir to combine. Place the mango chunks into a food processor or blender and puree until smooth. You need about 1 1/2 cup mango puree. Slice the remaining mango into small pieces. Pour the mango puree, eggs, melted coconut oil, and vanilla extract into another bowl. Mix to combine. Add the dry ingredients to the wet ingredients and fold until the batter is smooth. Do not overmix. 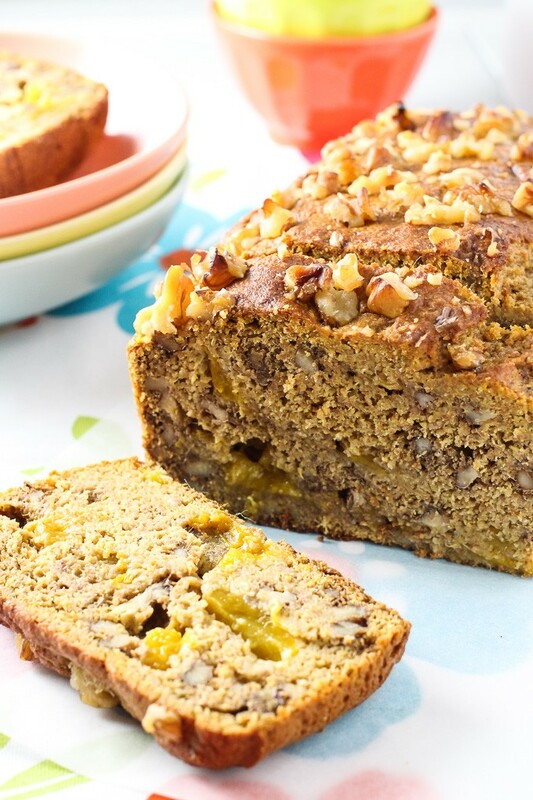 Add 3/4 cup walnut pieces and 3/4 cup mango slices and carefully mix until just combined. Pour the batter into a loaf pan. Smooth out the top and sprinkle with the remaining walnut pieces. Place into the preheated oven and bake for about 1 hour, until risen and golden and an inserted toothpick comes out clean. Let it cool in the pan for about 10 minutes then transfer to a cooling rack. Nutrition information is a rough estimate for 1 of 12 slices.